LAKEVILLE, IN. 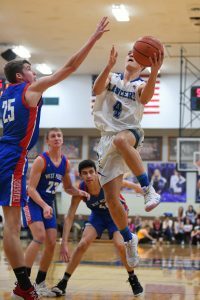 – The Class 2A #7 LaVille basketball team got off to a good start and set the tone both offensively and defensively in a 49-34 Hoosier North Athletic Conference victory over Triton. LaVille hit six 3-pointers in the first quarter to get the offense going, and then held Triton scoreless in the third quarter to seal the HNAC victory. Jared Beehler and Luke Beehler hit a pair of 3s, while Rilye Cox and Bobby Good canned a 3-pointer as the Lakeville hosts opened a 20-12 lead. LaVille took control of the game in the middle quarters by being more patient on offense and pressuring Triton defensively. The Lancer defense did not allow one Triton player to score in double-digits and held THS to just 2-of-9 from beyond the arc. “We really did a good job at getting out on their three-point shooters as well as keeping them from penetrating to the basket,” said Edison. Luke Beehler converted a pair of free throws to give LaVille its largest lead at 49-30 with 1:54 left in the fourth quarter. LaVille struggled against West Noble from the charity stripe, hitting just 12-of-21 attempts, in the last game. This time, however, the Coach Edison was pleased with the free throw effort. Luke Beehler led all scorers with 19 points, while Bobby Good added 10 points off the bench. Good played 16 solid minutes, went 4-of-6 from the field, including a pair of crucial 3-pointers, added two rebounds and had an assist. 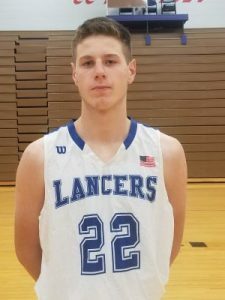 Connor Wieczorek added four rebounds and four assists for LaVille, while Cox led a balanced rebounding attack with five. LaVille improves to 15-3 overall and will travel to South Whitley to take on Whitko. The JV game will tip at 6 p.m.
Last Outing: LaVille defeated Triton, 49-34. Whitko defeated Central Noble, 73-66. Series Last 30 Years: Whiko leads LaVille, 1-0. Last Meeting: Whitko defeated LaVille, 54-45, December 30, 2011.